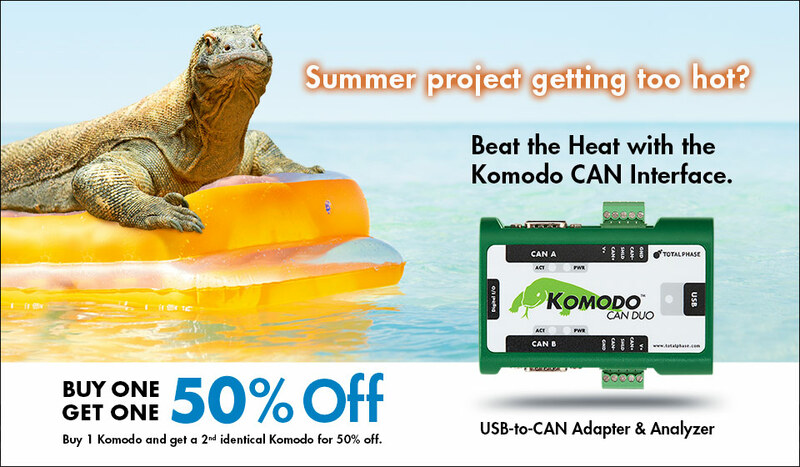 Things are heating up as the summer months approach and the Komodo CAN Interfaces are primed to help you get your project done on time so you can enjoy the warm summer sun. The Komodo™ CAN Interface is a powerful USB-to-CAN adapter and analyzer; it’s an all-in-one tool capable of active CAN data transmission as well as non-intrusive CAN bus monitoring. With the option of two models you can select the right Komodo interface for your needs. Both offer a royalty-free API, and cross-platform support for Windows, Linux, and Mac OS X. Enter coupon code “Summer2015” during checkout to receive your discount. Did you know the Promira™ Serial Platform offers improved throughput over USB compared to the Aardvark I2C/SPI Host Adapter? The Promira platform has a high-speed USB port, compared to the Aardvark adapter’s full-speed connection. In addition the Promira platform features a pipelined architecture that allows for queuing of commands. The Beagle USB 480 Power Protocol Analyzer is ideally suited to address this type of challenge. The Beagle USB 480 Power analyzer combines the ability to monitor USB traffic in real-time with the capability to track current and voltage readings on the VBUS. Using the Data Center Software, users can correlate anomalies, such as current overdraw, on the VBUS with data being sent across the USB bus. The analyzer provides insight into what caused the system to malfunction and how to fix the production test or improve product design. For more information visit the Beagle USB 480 Power Protocol Analyzer product page.